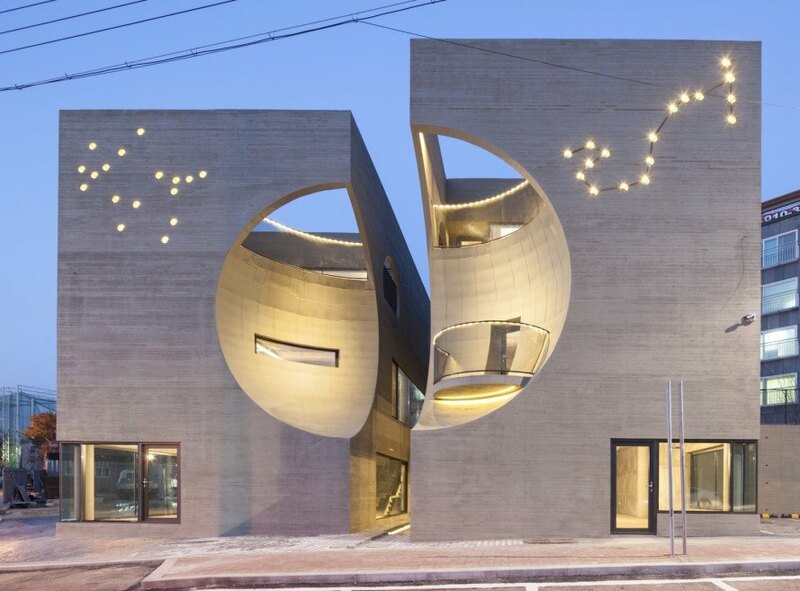 South Korean architect Moon Hoon is famous for his playful cartoon-like designs, and his latest Two Moon building does not disappoint. Located in Goyang, a town near Seoul, the project comprises two concrete volumes, each with large crescent-shaped indents that line up to form a large and recessed moon-like sphere. The mixed-use buildings incorporate additional astronomical motifs such as constellations and feature an art gallery, a coffee shop, and rentable office and event spaces. Two Moon’s quirky design was inspired by ‘Two Moon Junction,’ a movie drama about the affair between a college graduate and an older man and constrained by a very limited budget. The client requested the project include two separate buildings, one for himself and the other for his younger brother. Each three stories tall, the buildings are slightly offset with one placed closer to the street than the other. This arrangement gives depth to the full moon-shaped recess, which appears to comprise two parts: a crescent moon and gibbous moon. The moon theme is continued in the interior with circular windows, crescent-shaped balconies, domed ceilings, and constellation-shaped perforations. The minimalist walls are made up of exposed reinforced concrete and cement bricks. The mostly gray color palette is complemented with black metal door and window frames, balustrades, and stairs. The third floor of both buildings features a domed roof with skylight and opens out to a small outdoor patio; Two Moon also has twin roof terraces with outdoor gardens and cutouts that frame views of the street. Two Moon’s quirky design was inspired by ‘Two Moon Junction,’ a movie drama about the affair between a college graduate and an older man and constrained by a very limited budget. The client requested the project include two separate buildings, one for himself and the other for his younger brother. Each three stories tall, the buildings are slightly offset with one placed closer to the street than the other. This arrangement gives depth to the full moon-shaped recess, which appears to comprise two parts: a crescent moon and gibbous moon. The moon theme is continued in the interior with circular windows, crescent-shaped balconies, domed ceilings, and constellation-shaped perforations. 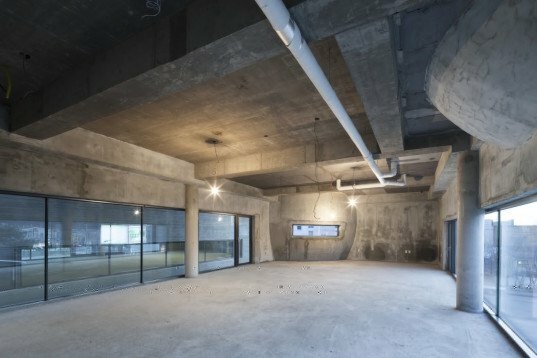 The minimalist walls are made up of exposed reinforced concrete and cement bricks. The mostly gray color palette is complemented with black metal door and window frames, balustrades, and stairs. The third floor of both buildings features a domed roof with skylight and opens out to a small outdoor patio. Two Moon also has twin roof terraces with outdoor gardens and cutouts that frame views of the street. A domed ceiling with a skylight is located on the third floor. Floor plan of the first floor. Floor plan of the second floor. Floor plan of the third floor. Floor plan of the roof terrace.